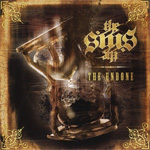 Rising from the Seattle underground music scene in 2001, The Sins return with their first album, Undone since regrouping after a brief hiatus. Being unfamiliar with this band was probably the best thing for this listener. Why? Billed as 'dark' rock, I wasn't quite sure what that meant. The Sins' roots are found in a post punk tradition, yet you can hear influences as far-reaching as Brit pop to American pop and rockabilly to pseudo-Seventies Doors. But that description will probably get you no closer to the sound of The Sins than anything else. Undone is eclectic and varied, and more often keeps you guessing. Compare the gothic and unearthly Chi Chi to the following rockabilly punk groove of Temple of the Midnight Sun. Or from dark goth punk of El Guitarro to the synth pop rock of Abigail. Some stuff is just crisp heavy rock, with synths of course, like No Tomorrow. The tapestry is broad, and the movements both unsettling and entertaining. Sometimes I think somebody threw The 69 Eyes, HIM, and Sisters of Mercy into a blender and hit the mix speed. Then I listen to clever rockabilly meets catchy country pop of Sintown and I throw up my hands and scratch my head. One thing's for sure: I can understand how The Sins were a cult sensation in their native Seattle and a potential underground legend elsewhere. While diversely eclectic, The Sins' Undone is wildly vibrant, creative, and entertaining. I'll bet they put on a darn good show, too. Check them out. While diversely eclectic, The Sins' Undone is wildly vibrant, creative, and entertaining.